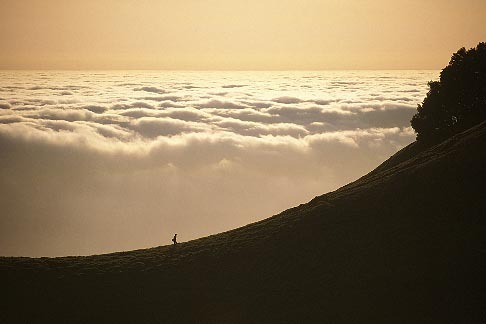 Warm summer days bring an offshore marine fog layer that sits off the coast of San Francisco, sometimes nestling up onto the flanks of Mount Tamalpais in Marin County. After a long hike on the mountainside, as the late sun brought an orange light to the western sky, I saw a solitary hiker on the ridgeline. Framed with a crescent hillside and the clouds below if conveys the airiness of the high peaks and the smallness of man in a vast and wondrous landscape. Gorgeous- never seen n image quite like it!